Hello and welcome to my blog. This is my first year of being a participant at 2 Bags Full's Grow Your Blog. Vicki is the owner of 2 Bags Full and is the coordinator of this wonderful event. Thank you Vicki for doing all this work. I look forward to meeting new people and their blogs during this event. My blog name is my actual name -- jojo hall. I adore all things fiber related and my hands are always in motion. I own a commercial embroidery business and teach digitizing, back-office production, and quilting. There is more about me on my About page above. I started blogging on blogger after losing many, many years of my blog that was on a different site. It was heartbreaking to lose all of that history because it was sort of like a diary to me. I know they are working on recapturing what was lost, but I decided to start blogging on my own so I have more control of the blog. Every Monday, I post a recipe of some of my favorite things. Other days are more hit and miss and are open to whatever I'm working on at the time (embroidery, sewing, quilting or in the summer -- gardening!). My goal is to post three times a week. I hope to always have something entertaining for you to read whenever you decide to visit me again. I love your Hawaiian quilt pillow. I've personally enjoyed Hawaiian applique for many years. 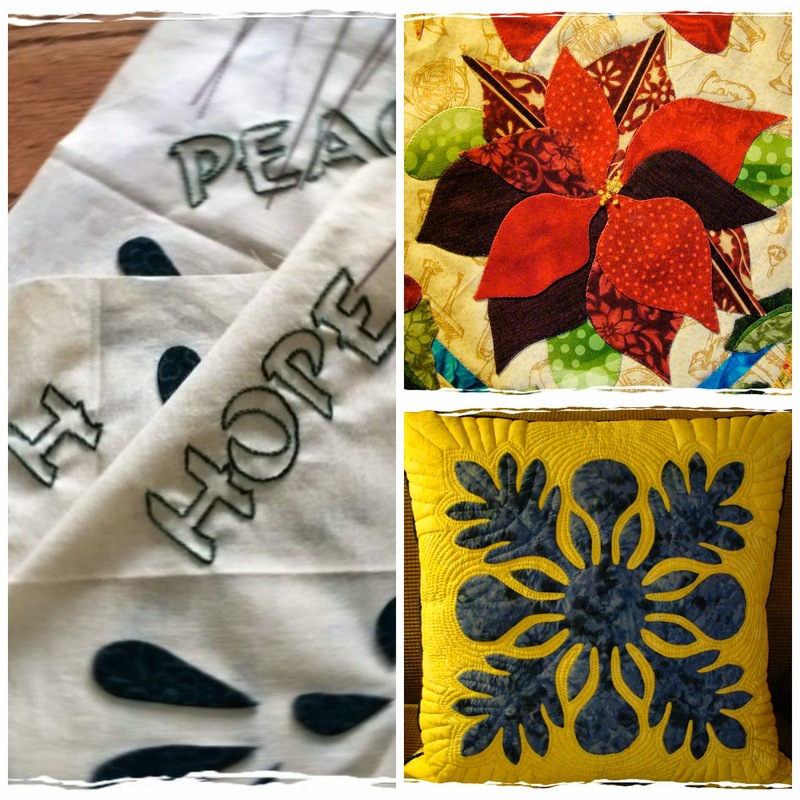 Have you shared on your blog more about this project, or other Hawaiian quilts? I don't see them in your index. PS - I host a weekly #CreativeGoodness Linky Party every Friday where you can share any creative project that you want to share and inspire. I hope you'l join the fun as it can also be a great way to increase awareness of your blog. I love linky parties and will check in with you this Friday! Thanks for commenting. I've got you on my blog feed but don't think I've seen you in awhile! Anxious to see what you are up to in both the kitchen and the craft room. I'm a friend of Margaret's who appreciates the arts. Keep up the good work! Thanks for visiting my blog and for commenting. Greetings from Canada. So nice to meet you via the GYB party. I love your Hawaiian quilt pillow. I look forward to following your blog. Hi Debbie. Glad you took the time to post a comment and to follow me. Isn't the GYB party fun!!! I'm still making my way through the hundreds of new-to-me blogs that are participating in the party. You make lovely quilts, but it looks like you are just as proficient in the kitchen. Your recipes look yummy. I am hungry just looking at them. I really enjoyed visiting your blog. It was a genuine breath of fresh air. Ah, I knew it! I saw you listed on GYB, but hadn't been here yet. Following on Bloglovin now. I scrolled down and saw your 10,000 piece hexxie project and I'm sitting here in complete and total awe. Talk about amazing!!!!!! Working with pieces that small would drive me round the bend so I have to admire you so much. Thank you for inviting us to visit! Greetings! So loving all the projects on your blog and have become a new follower. I have just learned and started a small EPP quilt. So many things I want to try and to little time. Hi - We just moved from Clackamas OR to Bullhead City AZ small world. I came over from GYB - this is my first year in there too. Nice to meet you.